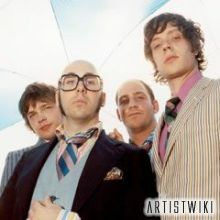 OK Go is an American indie rock band which formed in Chicago, Illinois, United States in 1998. The band consists of Damian Kulash (guitar, vocals), Tim Nordwind (bass), Andy Ross (guitar, keyboards), and Dan Konopka (drums). The band is best known for their singles “Get Over It”, “A Million Ways”, “Here It Goes Again” and “This Too Shall Pass” and for their high concept, low budget, one-shot music videos.